"Rock of Ages" is a popular Christian hymn written by the Reverend Augustus Toplady in 1763 and first published in The Gospel Magazine in 1775. The fissure that is believed to have sheltered Toplady (51°19′31″N 2°45′12″W﻿ / ﻿51.3254°N 2.7532°W﻿ / 51.3254; -2.7532) is now marked as the "Rock of Ages", both on the rock itself and on some maps,[clarification needed] and is also reflected in the name of a nearby tea shop. The German translation is called "Fels des Heils". "When my eyes shall close in death" was originally written as "When my eye-strings break in death". 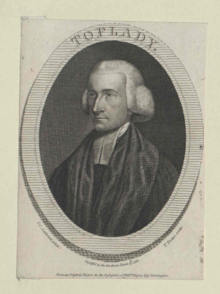 There has been speculation that, though Toplady was a Calvinist, the words, "Be of sin the double cure, Save from wrath, and make me pure," suggest that he agreed with the teachings of the Methodist preacher under whom he received his religious conversion, and of his contemporary, John Wesley, who taught the "double cure," in which a sinner is saved by the atonement of Jesus, and cleansed from inbred sin by the infilling of the Holy Spirit. Toplady's own published hymnal of 1776 refutes such a notion, with the lines: "Be of sin the double cure, Save me from its guilt and power," a clear indication that the double cleansing was from the guilt and power of sin. Some contemporary artists, including Amy Grant in her recent rendition, prefer the words, "Be of sin the double cure, Save me from its guilt and power," possibly suggesting[original research?] a disagreement with the holiness movement doctrine of two works of grace. [a] Grant's version appears as the title track to her 2005 studio album Rock of Ages... Hymns and Faith. It was later included on her 2015 compilation album Be Still and Know... Hymns & Faith. Rock of Ages refers to Jesus. It is a play on words, making a connection between the smitten rock in the Old Testament and Jesus' smitten body. This is obviously shown in the lyrics, when Toplady writes "Rock of Ages, Cleft for me." Here his pun is based on the fact that the rock was split versus the fact that Jesus' body was broken for His people's sins. He later uses another double meaning, writing, "Let the water and the blood, From Thy wounded side which flowed." The word "Thy" is used to mean two different things here; the first is based on Exodus 17:6, which states, in part, "Strike the rock, and water will come out of it for the people to drink," and John 19:34, which says, "Instead, one of the soldiers pierced Jesus’ side with a spear, bringing a sudden flow of blood and water." The hymn also refers to God the Trinity as the Rock of Ages as proven by Isaiah 26 verse 4:"Trust in the Lord forever, for the Lord, the Lord Himself, is the Rock eternal." "Rock of Ages" is usually sung to the hymn tune "Toplady" by Thomas Hastings or "Redhead 76" by Richard Redhead or "New City Fellowship" by James Ward. "Toplady" is most typical in the United States and "Redhead 76" in the United Kingdom, although both tunes circulate in the churches of both countries. How the West Was Won (1962) – performed by all at the Prescotts' burial. In the film Merry Christmas, Mr. Lawrence (1983), the hymn is sung poorly by the character of Major Jack Celliers, played by David Bowie. In the film The Silence of the Lambs (1991), the hymn is being played on the organ in the funeral scene in which the protagonist experiences a flashback to her father's own funeral. In the film Hang 'Em High (1968), the hymn is sung by the crowd watching the six-man hanging at Fort Grant. 1914 Alma Gluck and Louise Homer - a popular version on the Victor label. 1949 Bing Crosby recorded it on May 6, 1949 for Decca Records and it was included in his album Beloved Hymns. 1950 Jo Stafford with the Ravenscroft Quartet. Recorded 2 June 1950. Issued October 1950. Songs Of Faith Capitol CC-9014. 1950 Perry Como recorded it June 29, 1950 and included in the 1952 EP Favorite Songs of Worship. 1959 Pat Boone for his album He Leadeth Me. 1959 Rosemary Clooney included it in her album Hymns from the Heart. The hymn was a favourite of Prince Albert, who asked it to be played to him on his deathbed, as did Confederate General J.E.B. Stuart. It was also played at the funeral of William Gladstone. In his book Hymns That Have Helped, W. T. Stead reported "when the SS London went down in the Bay of Biscay, 11 January 1866, the last thing which the last man who left the ship heard as the boat pushed off from the doomed vessel was the voices of the passengers singing "Rock of Ages". The opening lines of the hymn are used in the chorus of "Birmingham" by the band Shovels & Rope. 1980s British rock band Def Leppard were inspired by the ancient hymn's text when a member of a choir left their hymn book in their recording studio. Joe Elliott later wrote the lyrics to their song "Rock of Ages" after reading it and in their music video the band members dress up as monks. This hymn tune was featured throughout the Westminster location in the game Assassin’s Creed: Syndicate. It is heard from the music boxes as well atop Buckingham Palace at the vantage point. This hymn was regarded as one of the Great Four Anglican Hymns of the 19th century. Johannes Maas, a leader in the faith movement, commented on this hymn, "The words of this hymn are among the most profound, inspiring, encouraging, sacred, devotional and precious words ever penned." In his score for Altered States, John Corigliano made reference to this hymn many times, to symbolise the religious struggle of the hero and the memories of his anti-religious father, which figures in one of his hallucinations. The hymn has appeared in other languages including German (as "Fels der Ewigkeit") and Swedish ("Klippa, du som brast för mig"). There were also Latin translations by William Gladstone as "Jesus, pro me perforatus" and by Canadian linguist Silas Tertius Rand as "Rupes saeculorum, te." On reading this version, Gladstone wrote to Rand, "I at once admit that your version is more exact than mine". This hymn was also translated to Telugu, a south Indian language spoken by nearly eighty million people. The hymn is included in Andhra Christava Keerthanalu, the hymnal of the Andhra Evangelical Lutheran Church headquartered in Guntur. It is titled Naakai cheelcha badda and is hymn number 342. It was translated into Mizo (a language of northeast India) by Rev. Rohmingliana as Chatuan lungpui, aw Krista and appears in a hymnbook called Kristian Hlabu. ^ Amy Grant is a member of the (non-Calvinist) Churches of Christ. ^ a b "Bible Gateway passage: Exodus 17:6 - New International Version". Bible Gateway. ^ a b c "Bible Gateway passage: John 19:34 - New International Version". Bible Gateway. ^ "Bible Gateway passage: Isaiah 48:21 - New International Version". Bible Gateway. ^ "library.timelesstruths.org quote: Rock of Ages". timelesstruths.org. ^ "Bible Gateway passage: Isaiah 26:4 - New International Version". Bible Gateway. ^ Worship and Service Hymnal. Chicago: Hope Publishing. 1957. p. 223. ^ "Rock of Ages Lyrics". Timeless Truths. ^ "Internet Movie Database". imdb.com. Retrieved June 20, 2017. ^ Whitburn, Joel (1986). Joel Whitburn's Pop Memories 1890-1954. Wisconsin, USA: Record Research Inc. p. 175. ISBN 0-89820-083-0. ^ "A Bing Crosby Discography". BING magazine. International Club Crosby. Retrieved June 20, 2017. ^ "Perry Como Discography". kokomo.ca. Retrieved June 20, 2017. ^ "Discogs.com". Discogs.com. Retrieved June 20, 2017. ^ "Rock of Ages". The Cyber Hymnal. Retrieved 28 August 2010. ^ Stead, William Thomas (1900). Hymns that have Helped. New York: Doubleday & McClure Co. p. 141. ^ Littell's Living Age, November 1882. It originally appeared in The Spectator in the late 1850s. This page was last edited on 1 April 2019, at 23:48 (UTC).